2-513. Full length of the mature protein. 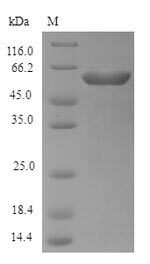 Small volumes of ppx recombinant protein vial(s) may occasionally become entrapped in the seal of the product vial during shipment and storage. If necessary, briefly centrifuge the vial on a tabletop centrifuge to dislodge any liquid in the container`s cap. Certain products may require to ship with dry ice and additional dry ice fee may apply. NCBI/Uniprot data below describe general gene information for ppx. It may not necessarily be applicable to this product. Degradation of inorganic polyphosphates. Orthophosphate is released progressively from the ends of polyphosphate of circa 500 residues long, while chains of circa 15 residues compete poorly with polyphosphate as substrate ().